Now that I am living and photographing in Florida, I'm also having to deal with many outdoor subjects in situations I didn't have to face much when photographing up north. Down here I'll be doing a lot more of my outdoor work around pools and beaches. On a recent lifestyle shoot with one model, I photographed her in a pool. Looking at the shot later in Photoshop, I decided that her skin looked a little too light and also not tan enough. Enhancing a tan in Photoshop is not very difficult. There are many ways of doing it. I have a fairly simple solution I thought might be of interest. So here it is. Above is the original image. I used the Quick Selection tool to make a select just the model's skin. The selection edges don't have to be perfect. Next, create a separate layer from the selection by pressing CTRL-J. The skin layer should look like above image. We will use two adjustment layers to enhance both the color and darkness of the tan. These will be placed just above the skin layer. The first adjustment layer is Brightness/Contrast. 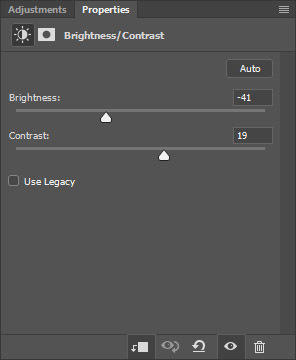 Click on the small down-arrow at the bottom of the adjustment layer so that is will be only applied to the skin layer below it, and not to the over all image. You can adjust this layer to suit the about of darkness you want. I used a -41 on the brightness and +19 pm the contrast. Next add a Color Balance adjustment layer below the Brightness/Contrast layer so that both are being applied only to the skin layer below them. 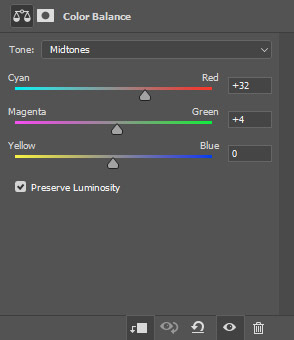 Enhance the tan color by increasing the Cyan/Red and Magenta/Green Midtones. I used a +32 and +4 as shown below. The Layers menu below shows how I had the layers laid out. The little down-arrow on the left indicates that the adjustment layers will only act upon the skin layer immediately below them. 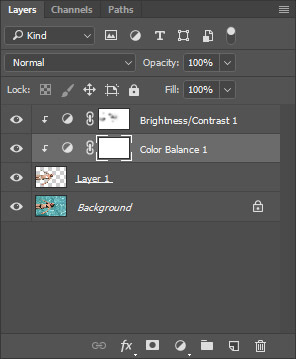 You want to keep both of the adjustment layers active at the same time and adjust them in unison. Note also that I painted out some of the effect form some areas that were already a bit dark by painting with a soft black brush on the Brightness/Contrast layer. The photo below is the completed image with a darker, even tan covering the model.